There aren’t many people today who hold the title of “shepherd” or can even claim to know someone who does. Yet our church culture is permeated with shepherd and flock imagery. Although most of us don’t have a cultural reference point for this imagery, Jesus’ audience in John 10 certainly did. Here, Jesus uses these metaphors after healing a blind man—one who heard His voice and believed in Him. He tells those who listen, “I am the good shepherd. I know my own and my own know me” (John 10:14). If we understand why Jesus uses this imagery to make His point, we can better understand what it means for us today. The scene presented in John 10:1–5 would have been familiar to a Jewish audience. Most families in any given village owned a few sheep that they kept in the courtyards of their houses. Several households together would hire a shepherd to care for their sheep. They would keep their sheep in a courtyard surrounded by a wall and often guarded by a gatekeeper. When the shepherd needed to enter the courtyards, he walked through the gates, which the gatekeepers opened upon recognizing him; but a thief—someone whom the gatekeepers didn’t know—had to climb over the courtyard walls. Likewise, the sheep eagerly followed the shepherd because they recognized his voice, but they would flee from the unfamiliar thief. In John 10:7–18, Jesus takes the metaphor further, describing Himself as “the gate of the sheep.” When in the open country at night, the shepherd placed the sheep in a round, stone-walled enclosure for protection. 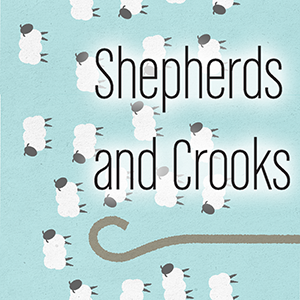 As long as the shepherd secured the opening—the “gate”—the sheep were safe from wild animals and thieves. Jesus uses this imagery to draw a parallel not only to Himself, but also to the Jewish leaders who burdened the people with heavy religious demands. These leaders are the “thieves and robbers” who threaten the sheep—the ones who treated the blind man of John 9 so harshly. Jesus is probably drawing His imagery from Jeremiah 23 and Ezekiel 34, passages that depict some of the kings of Israel as worthless shepherds who destroyed, scattered or lived off the sheep instead of protecting them. God’s fury against these kings shows His love for His sheep: “‘Woe to the shepherds who destroy and scatter the sheep of my pasture!’ declares the Lord” (Jer 23:1). God promises to raise up a Good Shepherd, a “Righteous Branch” (Jer 23:5), to rule over His people—“one shepherd, my servant David” (Ezek 34:23). By calling Himself the “good shepherd” (John 10:11), Jesus makes the radical claim that He is the fulfillment of these 500-year-old prophecies. In Jesus, these references to God’s role as the shepherd find their full expression (see Pss 23, 80; Isa 40:11). As a result, all who enter at “the gate of the sheep” by believing in Him experience forgiveness of their sins and become members of His people. In Him, we “have life and have it abundantly” (John 10:10). Jesus is unlike the evil shepherds of His age (the Jewish leadership) and past ages (those of Jeremiah, Isaiah and Ezekiel). He is the shepherd who becomes like a sheep, laying down His life. Although the sheep and shepherd might serve as only a gentle pastoral illustration in our communities, we have a powerful portrait of the “one shepherd” in John 10: the Lord Jesus Himself, who was “pierced for our transgressions” and suffered “the chastisement that brought us peace” (Isa 53:5). D. H. Johnson, “Shepherd, Sheep” in Dictionary of Jesus and the Gospels, ed. Joel B. Green, Scot McKnight, and I. Howard Marshall, (Downers Grove, Ill: InterVarsity Press, 1992), 751–754. Colin G. Kruse, The Gospel According to John, (Leicester: InterVarsity Press, 2003).